Corona Cigar Company Blog: The Diamond Crown Red Carpet Event! There’s another special event coming to Corona Cigar Co! We will be hosting the Diamond Crown Red Carpet Event at our Downtown and Sand Lake locations. It’s a perfect chance to meet both Newman brothers! There will be a new cigar that they'll debut at the event, the Diamond Crown 1895, which was made in small batches in honor of their 110th anniversary at Diamond Crown. This cigar is only available at Diamond Crown Lounges. We will also be having specials on all Diamond Crown cigars: Buy 3 singles: get an 1895 for free. You can also buy a box of Diamond Crown cigars and get 5 Diamond Crown 1895’s, a Diamond Crown hat, and a 3 cigar sampler that comes in a leather case which include a DC Maximus, a DC Classic, and a special DC Cameroon cigar. The event will be held at our Downtown location on Friday, May 18th from 6:00 PM to 12:00 AM, and Saturday at our Sand Lake location from 2:00 PM to 8:00 PM. 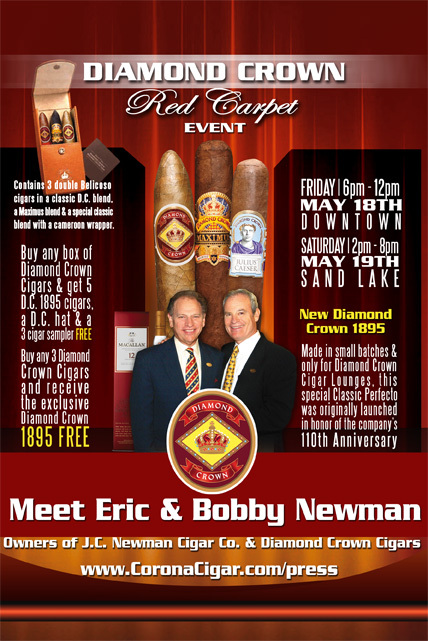 Make sure to stop by for your chance to pick one of the limited cigars up, and have a great time with the Newmans!